Poor Pony is not having a very good Valentine's Day! She's fine, but we did have to cancel some cool plans this weekend to keep an eye on her. At least her new collar/cape is very amusing. The saddest little flower. 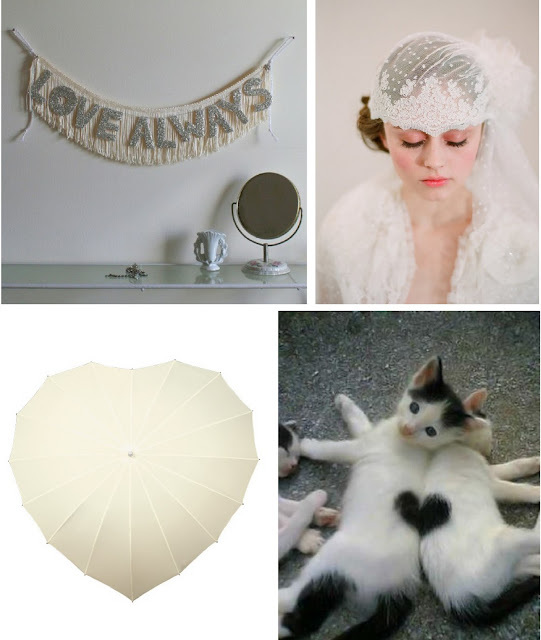 Here is some pretty imagery I have been collecting for the past little while, because as far as I'm concerned, love and hearts are worth celebrating every day -- and at my house, we do. No one has a monopoly on love, so just let it flow. Previously Owned: Oh yeah, lots of people have mentioned Lush -- I haven't had much luck with Lush, though. erin jane / atlantic treefox: Yeah, it's worth a shot! The shop does say she makes things specifically for sensitive skin! Michelle of The Feather Den, Annie, Natalie, erica-knits, Kate, Cassandra, jlee, JustChiffonandDandy, Sarah, julie, Jane Flanagan: I agree! She does beautiful work and I'm looking forward to receiving my soaps and trying them out. Danielle: It's true, the scents are a big problem. I also hate that so many of them are anti-bacterial by default. Stephanie: Yes, you're so right about that! At work I have to use whatever anti-bacterial liquid soap they put in the pumps and I am constantly having to moisturize. Not so much at home, though. Bite The Beat: Yes! Everything is better in small batches. Siubhan: Oh, indeed! I'm hoping to learn how to do it myself. Wishcandy: Yes, I don't like shower gels too much myself -- they really make a mess in the bath and leave a film on the tub when I'm in a hurry! erin: I'm sure the scents are delicate and lovely. They must be! amy w - over and under: Oh no, that's too bad! Hwasoon: Thank you for doing beautiful work! I can't wait to get my soaps. BH: Oh, thanks so much! So nice to hear. Anonymous: Thank you! I have a Toronto tag on my posts, so when I talk about anything local they should be easy to find! But I will do my best to post more Toronto-related content! I'm glad you enjoy it. sweetie pie press: I completely agree! I see no reason for spending more than $6 on something that is on your face for about thirty seconds at the most. kater: Ha! Nooo, don't do it! Victoria / Cats Dreaming in Keylime: Nothing better than clean, it's true. Anonymous: Hi Alyce! I wrote a post here that mentions a few of my favourite places: http://fieldguided.blogspot.com/2010/03/my-tronnow.html I also have a tag called "Toronto" that should pull up most of my Toronto posts. If you'd like more information or more ideas, please feel free to email me! Kitty Stampede: Oh yes, pear is such a wonderful scent! The funny thing is I don't like eating pears as much as I like the smell of them. Denise: It's relatively new to me as well, but I love it! And that's lovely collection there! Aw, Pony. I can say though, the kitty poncho -- as we referred to it -- is much better for the little guys than the usual cone. Our poor cat haaated that cone, and kept bumping into everything. He wasn't thrilled about the poncho, but at least it didn't block his vision or whiskers. Willy had to wear his for two weeks because of eye surgery; he had quite the cleaning session when it finally came out. Get well soon, Pony! poor pony! it's one of those things where you feel bad for her, but can't help but smile at the cuteness! oh pony! you make my heart melt! it looks like a A line dress on her! Oh, Pony! I said it out loud and sort of guffawed/cried at the same time. She's like, "I did not sign off on this Pierrot costume." I hope Pony is feeling better soon. That picture is just too adorable though. maybe blue is not her color? Oh my gosh, your kitty is adorable! Hope she feels better soon, even though her cape looks quite regal. oh no. poor pony & her collar made me laugh & laugh. get well soon little pony! you know, i spent 34 minutes over christmas trying to get my lovely feline companion to partake in similar fashion excursions, but to absolutely bloody no avail. too fast, the darn thing, and not a bit happy. I love all these images... but those heart kittens are too perfect and most likely the best thing I will see all day <3 !!!! PPOOOORRR PONY! holy moly, she's having a bad valentine's. she still looks adorable though! happy valentine's, regardless of an actual celebration or not! when your loved one is sick. Oh dear, Pony's little cape is the saddest, sweetest thing ever. She looks like a little spaceship! Hope she get's well soon. Yippee! So honoured to see my little swan featured in this gorgeous line up. Get well soon Pony! On the bright side, your cape is very on trend right now. that photo of pony wanted to pull the corners of my mouth up and down at once. So helpless and frail yet... extremely amusing. but she does look cute! your sweet pony - still cute with her sad face. the kitties that make the heart is too cute. aww..thanks for thinking of my banners on love day! ..i just discovered that veil today! someone who "heart-ed" a banner must have also "heart-ed" the veil..it's LOVELY. i really like it a lot! and that mixtape is really pretty..wonder what it is from? Awww poor little petal! Poor thing, she is just too adorable in her sadness. She does look fancy in her cape though! rose gold is the best kind of gold! pretty little ring. Aw man, I love laughing at cats, especially seeing as they don't get upset. Just the looking silly part, of course! PONY! 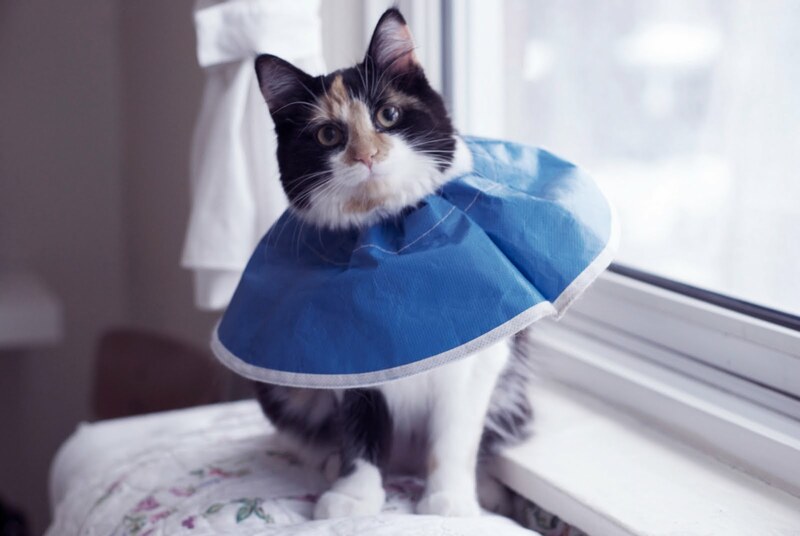 That collar is just too amusing; poor little girl! You guys must be alternately laughing and awww-poor-kitty-ing. Awww, poor Pony! She looks absolutely adorable though... Love this collection of images. Thanks for linking to my Pinterest! Happy Heart Day! What's wrong with Pony? Is she sick? Pony is such a pretty little thing. I'd love to fix her up with my little peewee, Henry. He likes calico cats! poor little pony! i hope she feels better soon! she's so lovely. aww, poor little princess! she looks about as miserable as my cat when we take him to the vet (heart-wrenching "meow" to boot). At least they have short memories and she'll forget about it soon. Hope you had a lovely, heart-filled day Anabela. Poor little kitty. She does look like a sad little flower doesn't she. She's lucky have you guys take care of her for Valentines! wow - i've never seen one of those ... cat necklaces! it's so cute/sad/funny when my dog has his little cone on so he doesn't bite his feet... but that skirt cat thing takes the cake for cute. J'aime, lots of inspiration. Thanks!